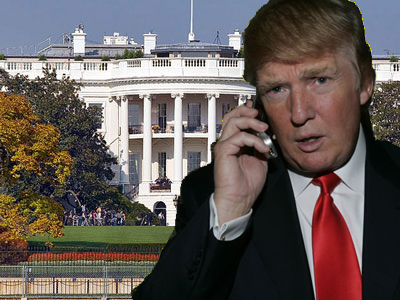 Don't you want to hear Donald Trump tell the establishment in Washington: You're fired!!! He's already President of corporations, employs thousands and who knows better than the Donald just what it's like to go beyond broke and still parlay that into success? I don't know about you, but I am tired of the tassle shoed, glib, silver tongued harvard/princeton/Rhodes Scholar type graduates telling us how to live. They never held an honest job in their life besides working as chronic politicians, community organizers, or in some government policy making job somewhere. With all of their purported knowledge, they have steered our nations ship onto the shoals of bankruptcy. I want someone in there who has had to meet a payroll and knows what it is like to deal in the real world and has had to labor under the same laws that the politicians in Washington subject us to. Give us someone who has had to work in the sausage factory of the private sector and knows the sometimes ugly, sometimes trying process it takes to get that slickly wrapped (USDA inspected I might add) package of sausages to the market...and make a profit. Donald Trump has noted in a recent interview with Newsmax:" My friends from China said to me just recently — they didn’t know that I might be thinking about running for president — we cannot believe how stupid your politicians are to allow us to get away with what we’re getting away with". The main stream media probably won't annoint Mr. Trump with the presidency, they'll go after him and his public/private life history and try to stifle him or anyone else that dares to come out of the non approved woodwork to take the helm of our ship, but the moment is coming for a captain of the private sector to climb into the bridge and take charge. Because as sure as when ToTo pulled the curtain aside to expose who was the real wizard of Oz, we are now seeing, courtesy of the new media, who is behind the curtain in Washington DC.... and frankly my fellow Americans, we can do much much better.